Ever since the last post about Docker Machine things have evolved quite a bit, and we would like to keep you up to date! Docker-Machine has changed its plugin architecture, and we have since then adapted to this new architecture and registered the OpenNebula plugin. It’s very easy to install OpenNebula support for Docker Machine. You will need to have a fully working OpenNebula cloud, and it must be accessible from your client machine, you can use ONE_AUTH and ONE_XMLRPC to connect to OpenNebula. Read more here: OpenNebula Shell Environment. NOTE: This guide is specific for KVM, if you would like to try this plugin out with the vCenter hypervisor, or with vOneCloud, there are a few small differences, so make sure you read this: Docker Machine OpenNebula plugin with vCenter. In particular you will need to use the option –opennebula-template-* instead of –opennebula-image-*. You can download either of those two images into your OpenNebula instance and use them for Docker Machine. Or, you can prepare your own image, using your favourite distribution, as long as it’s supported by Docker Machine and it has the latest OpenNebula Contextualization packages. The following diagram visualizes how we are going connect from a local computer, the docker client, to a docker engine deployed in a provider: OpenNebula in our case. Step 1: Install Docker Machine in your client machine. However, for any clarifications, please make sure to read the Docker Machine OpenNebula Driver plugin guide. As simple as that! This will start a new VM in OpenNebula, and it will be your new Docker Engine! I would like to personally thank Marco Mancini for doing the new plugin integration and helping devising and designing this integration! This is not the last you’ll hear from us. 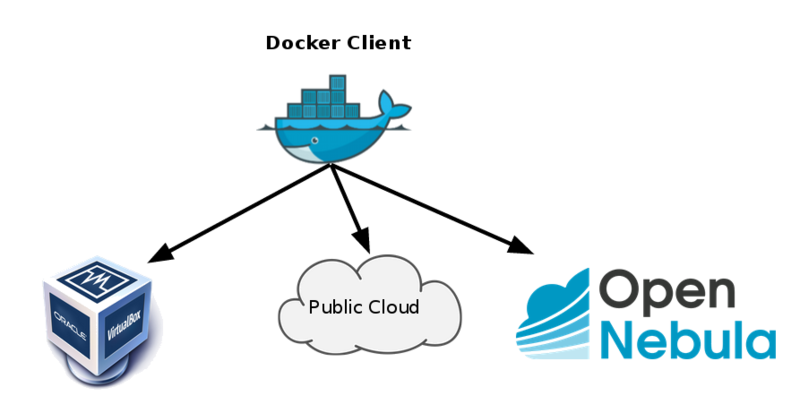 We will publish soon a guide on how to use Docker Machine to deploy Docker Swarm using OpenNebula as the backend. We also have some more surprises involving OneFlow. Stay tuned! And now, go try it out and have fun! Send us an email at events@opennebula.org if you are interested in speaking at one of the TechDays and register as soon as possible if you are interested in participating, seats are limited!. We look forward to your answers! OpenNebula Conf 2016 is getting closer and we would like to share with you the first Platinum Sponsor, StorPool Storage. You can meet them in the booths area during the coffee and lunch breaks. If your company/project is interested in sponsoring OpenNebulaConf 2016 there are still slots available. StorPool is intelligent storage software that runs on standard servers and builds scalable, high-performance storage system out of those servers. It focuses on the block-level storage and excels at it. OpenNebula is the preferred cloud management system for StorPool. It is simple, yet powerful and works very well. StorPool is already integrated with OpenNebula. The integration is performed as a new datastore driver in OpenNebula. With StorPool, OpenNebula clouds get exceptional storage bandwidth, IOPS and low latency. This allows provisioning more VMs per host which increases utilization and ROI. Combining both products also allows for seamless scalability in capacity and performance as well as increased reliability. At the event StorPool will demonstrate the joint solution, answer any questions and will help customers to improve the design of their cloud. If you want to participate in OpenNebula Conf and meet StorPool and other OpenNebula users, remember that you are still in time for getting a good price deal for tickets. StorPool Storage is going to host the first OpenNebula event ever organized in Bulgaria. On February 25th OpenNebula and StorPool are joining forces for a special one-day community event full of useful workshops and presentations all focused on how to take the most out of your private cloud. Jaime Melis, co-founder of OpenNebula, is coming to Sofia for a hands-on tutorial on how to create and manage your own OpenNebula cloud. The event is targeted at systems admins, cloud architects, system integrators, devops architects, solutions architects, data center admins, community members and non-members from Bulgaria and the region. Free Registration here. Seats are limited. Call for speakers: Email events@opennebula.org to become one of them, you are invited to share cloud use cases and deployment experiences, introduce new integrations and ecosystem developments, or describe other related cloud open-source projects and tools. StorPool Storage is looking forward to welcoming anyone interested in building their own OpenNebula cloud in Sofia! See you all soon! StorPool integrated with OpenNebula in March 2015. Deploying OpenNebula for cloud management and StorPool for block storage any company can now enjoy an efficient IT infrastructure; more details: here. Hostings like METANET are already successfully using the combined solution. StorPool assisted METANET with designing and bringing up many details of the service such as backup and in improving behaviour of the cloud management system. Check this Newsletter to find out the what kept us busy this month: latest developments, events and future plans for the upcoming months. We are starting this 2016 willing to share with the OpenNebula community another chapter of excellent cloud management. If you, as we do, like planning ahead check the sponsorship opportunities for the next OpenNebula Conf 2016, due in October in Barcelona. Take a look also to the projected OpenNebula TechDays for this year. The OpenNebula team, after the release of a new maintenance release for Great A’Tuin, the 4.14.2, is working around the clock on the next upgrade of OpenNebula, v5.0. This new version will come packed with features and interface changes to iron out the wrinkles in the user experience, to make the experience managing and using an OpenNebula cloud even smoother. vCenter storage management (you are right, including datastore selection and disk hotplug), fully integrated virtual router management (including default and transparent HA for routers), marketplace datastore to easily import/export images to other OpenNebula clouds (we think this is a badass feature), Cloud View improvements, and a long list of other features. As a teaser see this blog entry about resource tagging in Sunstone to keep VMs, networks, images and templates perfectly organized. OpenNebula shows its increasing maturity, with 73% of deployments in production compared to 62% reported in our previous survey. Growth in North America has accelerated, now representing 30% of responses, up from 20%. KVM provides the majority of OpenNebula support, growing from 48% to 79%. There is a high rate of adoption in VMware environments from 28% to 37%. Ubuntu grows from 36% to 40% and Debian falls from 33% to 22% as OS to build the cloud. The use of the EC2 cloud API decreases from 25% to 10%. The OpenNebula community never sleeps! Well, that may be an overstatement, but certainly when they don’t they contribute to the common knowledge as well as come up with cool integrations to enhance the already mighty power of OpenNebula clouds. Floating IPs for OpenNebula can be easily achieved now thanks to this nifty tool developed OpenNebula clouds, developed by the same authors as CloudVAMP and Docker drivers. Billing is crucial for VPS providers, which will greatly benefit from this provisioning module for Blesta which can be plugged into OpenNebula infrastructures. It is crucial for an open source project such as your favourite cloud management platform to receive its users feedback. As you may heard from us before (once or twice), our roadmap is defined using our knowledge of our user and community developer needs. This is why it is so important messages like this one, with very useful feedback to be taken into account in future OpenNebula releases. Thanks, keep up the good work! Recently after our last OpenNebula Conference (talks, slides,pictures), the next, 2016 edition have been announced!. We know it is hard to plan that much in advance, but if you are willing to attend and can save now the date you can take advantage of a huge 40% discount in your Conf tickets. More information is available from the event site. Remember our December newsletter? We said you should stay tuned for the OpenNebula TechDay schedule in 2016. If you did then you already know about the quite a few already scheduled TechDays around the world for this year, to which we promptly added others in US. The OpenNebula Cloud TechDays are full day events to learn about OpenNebula with a hands-on cloud installation and operation workshop, and presentations from community members and users. TechDays hosts have an important role, and that is the local promotion of the event to gather OpenNebula enthusiasts in this technical event. If you are interested in participating in (or hosting) any of these TechDays agenda let us know. OpenNebula was spoken of in the Journée interministérielle du libre 2016 in France, country which recommends OpenNebula in their open source software reference list. Rubén S. Montero, our chief architect, gave an interesting interview to DatacenterDynamics magazine, check it out. OpenNebula Systems also announced this month its training plans for 2016 for Europe and US. These courses are designed to train cloud administrators to properly operate an OpenNebula infrastructure. Please contact us if your would like to request training near you. VMworld 2016 US, August 28 – September 1, Las Vegas (Mandalay Bay Hotel & Convention Center), Nevada, US. VMworld 2016 Europe, October 17 – 20, Barcelona (Fira Barcelona Gran Via), Spain.